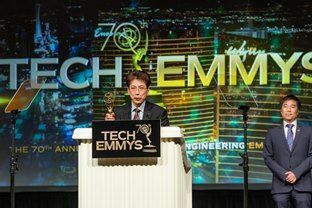 The National Academy of Television Arts & Sciences (NATAS) has honored the Panasonic Corporation with a Technology and Engineering Emmy® Award for Pioneering Development of the Single-Chip Color Camera. The Awards ceremony took place last evening in partnership with the National Association of Broadcasters (NAB) here at the NAB Show. Accepting the award for Panasonic was Hiroyuki Ohnishi, Director of Professional Video Business, Connected Solutions Company, Media Entertainment Business Division. Panasonic shares this award with developers Peter Dillon and Al Brault, along with four other professional video manufacturers. The NATAS’ committee determined that the genesis of the single-imager color video camera primarily took place between the proposal of a color filter array (CFA) in 1974 by Peter Dillon and the first commercial product from Hitachi in 1981, during which time Panasonic had done extensive development in realizing a single-chip interlace video camera including prototypes and publication. Panasonic’s core contribution was the “color difference line-sequential” CFA. This innovative approach was tolerant to interlace scanning, and relied on complementary colors that improved sensitivity and could easily be used to generate the Y, Pb Pr components required for a broadcast-type video signal. Panasonic continues pioneering innovation with the single-chip camera to overcome today’s challenges, such as simultaneously increasing resolution for 4K and delivering maximum dynamic range to support HDR. For instance, Panasonic’s current AK-UC4000 studio camera system abandons three-chip architecture in favor of large and well-proven cinema-style imagers along with internal expansion optics that allow the UC4000 to utilize 2/3” optics in a way that is transparent to the user and produce cinema level performance in a broadcast camera. Launched in 1948, the Technology and Engineering Emmy Awards honor development and innovation in broadcast technology and recognize companies, organizations and individuals for breakthroughs in technology that have a significant effect on television engineering. Panasonic has won a total of 18 Emmy Awards, 14 of them for advancements in the area of digital video technology. For more information about NATAS, visit its website at http://www.emmyonline.tv.